Version 3.0.0 is an update to Splatoon 2 that was released on 25 April 2018 at 01:00 UTC. 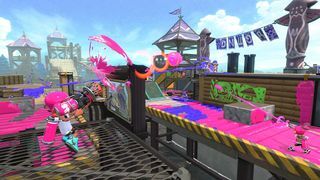 The update was first previewed during the Nintendo Direct on 8 March 2018. 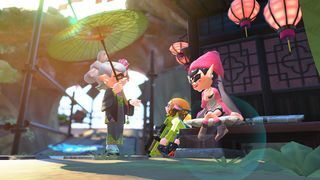 After meeting certain conditions, Callie will appear at Tentakeel Outpost. 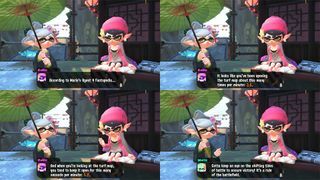 Players can talk to Callie to hear stats about their performance in multiplayer battles. Complete the final mission of Octo Canyon. 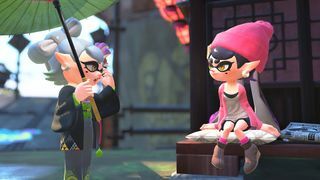 Return to Octo Canyon and listen to Marie's dialogue with Agent 4 about locking the final boss in a snow globe and adding a TV. Exit Octo Canyon, and then return again. 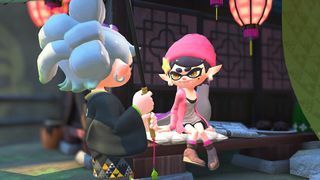 Players who had already met those conditions before the update did not need to do anything to unlock Callie. 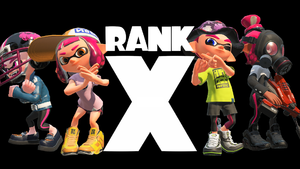 Player progression in Ranked Battle was enhanced with the addition of Rank X, replacing ranks S+10 through S+50. Players already ranked in S+10 through S+50 were automatically placed in Rank X. Rank X discards the rank meter in favor of X Power, a rating similar to Splatfest Power. Matchmaking is done based on X Power, so players will be fighting others with similar X Power rather than just anyone else who shares the rank. Monthly ranking lists will be published on SplatNet 2, featuring the players with the highest X Power. There will be a list for each of the four ranked modes that contains the top 500 players for the mode. An icon will show up above the player's name to show that they are in the Top 500. Another list will have the top player of each weapon. New lists will be made available on the final day of every month. At the time of the monthly ranking announcements on SplatNet, X Power will reset to "Calculating" status in-game. The calculation period, lasting 10 matches, determines if the player is eligible to remain in X Rank. It is also possible to drop out of X Rank outside of calculation periods, if the player's X Power drops low enough. Following the update, the Ranked Battle stage roster became limited to 8 possible stages per battle type, with the stages being refreshed with different sets upon the X Power reset time. League Battles and Turf War were unaffected by this change. Two new music tracks were added to be played during battles. Four new weapons were added. 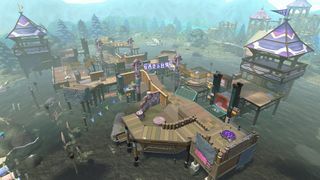 The stage Camp Triggerfish was added. 113 new pieces of gear were added. 26 headgear items were added. 53 clothing items were added. 34 pairs of shoes were added. During solo Splatfest matches, if an ally disconnects, the player's Splatfest Power will not decrease when losing. When playing a match with fewer allies than the opposing team, the player's Vibe Meter will not change when they lose. Fixed an issue incorrectly extending the range of certain weapons when attacking just prior to landing during a Super Jump. Fixed an issue where if a shot from an Inkjet appears to be a direct hit only to the target, the splash damage from the shot will not register. Fixed an issue causing a Sting Ray’s firing animation to continue to display on the screens of other players when getting on an Inkrail while using the Sting Ray. When an opponent who splats the player is using the Respawn Punisher or Haunt and the effects of those gear abilities is activated, that activation will stand out clearly on the screen while waiting to respawn. Fixed an issue in Clam Blitz causing the barrier to be destroyed at the same time the goal descended when Power Clams landed on top of the goal in its raised position. Fixed an issue in Starfish Mainstage where placement of obstacles could be slightly off causing slight asymmetry between the two sides of the map. Fixed an issue in Blackbelly Skatepark during Rainmaker matches allowing players to make their way deep into enemy turf by making the side of a crate in a player's turf uninkable, then making use of the side of the crate. 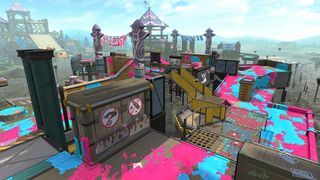 Fixed an issue in Piranha Pit during Tower Control matches allowing players to jump off the tower in the area of the 3rd checkpoint, reach an Inkrail, and make their way deep into enemy turf. ▲ Decreased trajectory variance of first shot while also increasing time required to reach maximum shot variance when firing continuously. ▲ Increased area covered by ink at the player's feet when firing. ▲ Now more likely to ink the area at the player's feet when firing. ▲ Increased firing range when holding ZR to fire continuously by roughly 4%. ▲ Decreased ink consumption when holding ZR to fire continuously by roughly 10%. ▲ Increased number of ink droplets generated by a horizontal swing, making the coverage on the area inked more consistent. ▲ Increased spread of ink droplets generated by a horizontal swing. ▲ Increased firing range after performing a dodge roll by roughly 13%. ▲ Increased area covered by ink droplets when shots hit a surface. ▲ Decreased time after using before ink recovery begins by roughly 1 second. ▲ Now possible to create a wall when a wall the player created already exists in the stage. Creating a new wall will cause the older one to disappear. ▲ Decreased least amount of time for wall to open after being placed by roughly 15/60 of a second. ▲ With the R button pressed and held, player is now able to go into squid form immediately by pressing ZL, even before the Ink Mine has been fully set. ▼ Decreased radius of ink coverage and damage dealt by Curling Bomb explosion when R is pressed and immediately released. ▲ Bomb now grows in size the longer R is held, increasing ink coverage while traveling and area of ink coverage and damage dealt when it explodes. ▲ Decreased amount of time before ink recovery begins after use in proportion to how long R button is held. ▲ Decreased ink consumption from 70% to 60% of ink tank capacity. ▲ Decreased degree to which less area is inked proportional to distance between Sprinkler and terrain floor when placed in a location with a different height than surrounding terrain. ▼ Decreased range of ink droplets and area of coverage during time after placement until Sprinkler output begins to weaken. As a sub weapon, the size of Curling Bombs will now change depending on how long the R button is held, but Curling Bombs generated by the Curling Bomb Launcher will always be the same size, regardless of button press duration. ▲ Due to this change, area of ink coverage while Curling Bombs are traveling has been increased slightly. 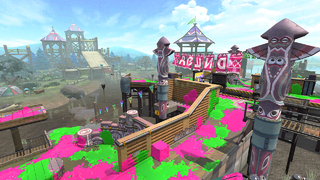 ▼ Due to this change, area of ink coverage and damage dealt by Curling Bomb explosions has been decreased slightly. ▼ Reduced damage dealt by roughly 10%. ▼ Players will now be pushed out of the spawn point's barrier when using Sting Ray from inside the barrier. Specifications for some of the abilities have been changed. ▲ Made effect more likely to occur even when used with fewer than maximum stacked Special Saver gear abilities. ▲ Improved effect of reducing maximum amount of damage dealt by stepping in opponent’s ink. ▲ Speed at which damage is dealt when stepping in opponent’s ink will now be slower. ▲ While active, Opening Gambit’s duration will be extended by 7.5 seconds for each opponent splatted by the player or assist they are credited with. ▲ Opposing players marked with Haunt will now incur the penalties of Respawn Punisher (additional time before respawn, further reduction of special gauge when respawning) when splatted. ▲ Duration extended from 6 to 12 seconds. ▲ Increased degree to which the effect of the gear ability Quick Respawn is nullified from 80% to 85%. ▲ After Drop Roller is used, the player will receive the effects of Run Speed Up, Swim Speed Up, and Ink Resistance Up for roughly 3 seconds. ▼ Decreased the boost to stats while Comeback is active from 1.2 times the value of the main gear power to 1 times that value. ▼ Ninja Squid will now nullify roughly 20% of the effect provided by the player’s Swim Speed Up gear ability. Added 5 weapons to the list of weapons available to choose from when playing Salmon Run at The Shoal. The 999,999p limit for Turf Inked by weapon was removed. ↑ Trailer for version 3.0.0 and Octo Expansion. ↑ The full Nintendo Direct 3.8.2018.